Artist Christine Ford creates rich and colourful contemporary quilts with an abstract flair often inspired by themes of nature and the human spirit. Her first quilt made entirely by hand took a year and a half to complete. Today with the aid of a sewing machine, she creates her own contemporary designs and specializes in a process called “free motion” quilting in which she literally draws with the needle. Improvising most of her designs, Christine uses commercial and hand-dyed fabrics that she often paints to achieve a desired effect. Also known for her innovative fabric vases and textile jewellery, Christine originally studied visual arts in school and ultimately discovered fabric to be her ideal medium. While her studies in textile art are ongoing, Christine is primarily self-taught. Her life before fabric was as a stage and screen performer and this theatrical background greatly influences her bold and dramatic fabric creations. As soon as I came across Christine Marie's website and all of her work of art, I fell in love. I'm an artist myself, and can appreciate great art when I see it. 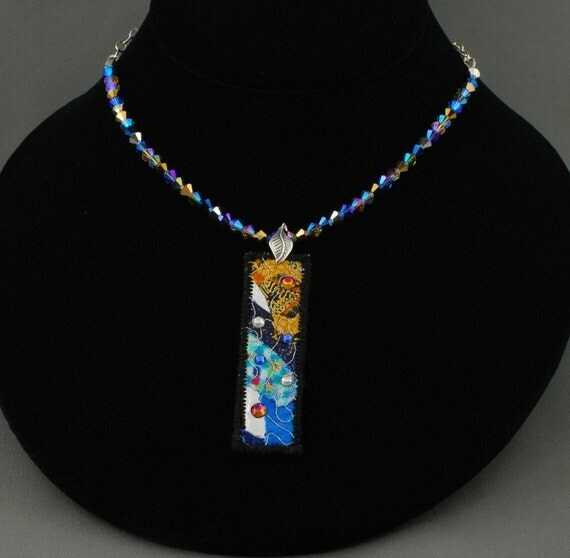 I contacted her and she was wonderful enough to share with me two items for review: Fine Fiber Art Miniature Om Masterpiece, and a beautiful sterling silver Fiber Art pendant. The pictures don't do her work justice... her art is so much more beautiful in person. 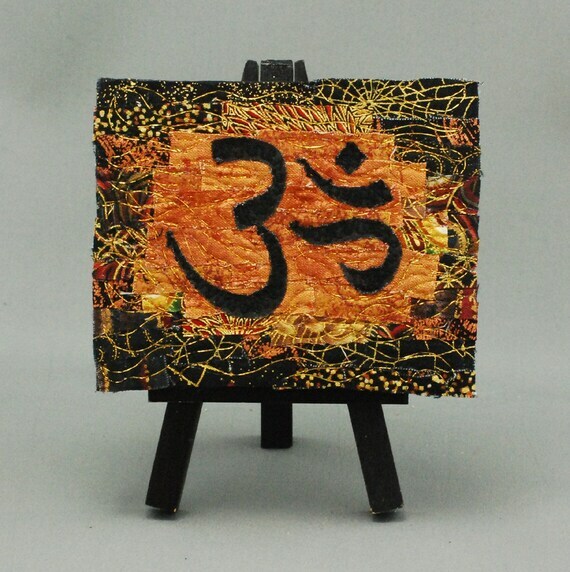 I love both the cute Om on the easle, as well as the pretty necklace. I've received so many compliments at work when I wore the necklace, that they even asked where they could get their own. Currently she doesn't have these type of necklaces listed yet, as they are NEW! 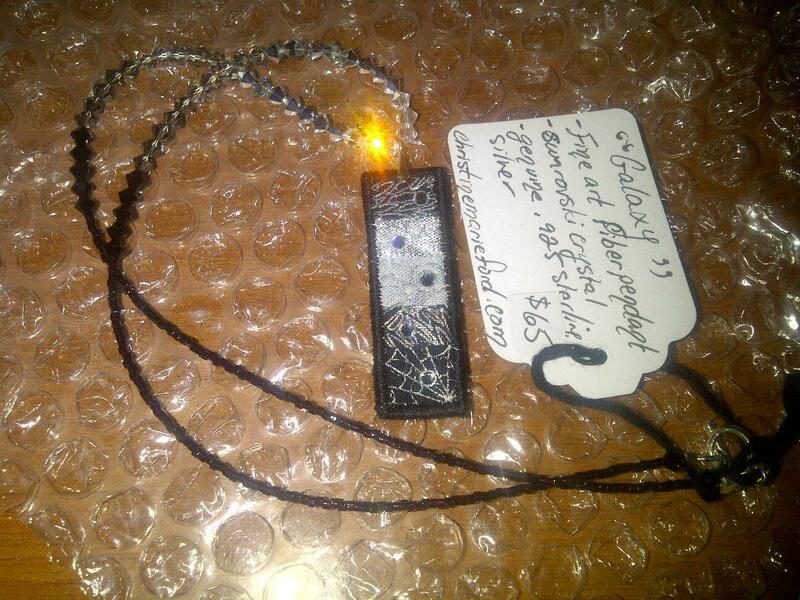 Check out Christine Marie Ford's Etsy Shop and keep an eye for when these type of necklaces get posted! She has many other awesome items for sale: quilts, leather and suede journals, leather and suede sketchbooks, bookmarks, big wall masterpieces, small masterpieces on an eisle and many types of jewellery.